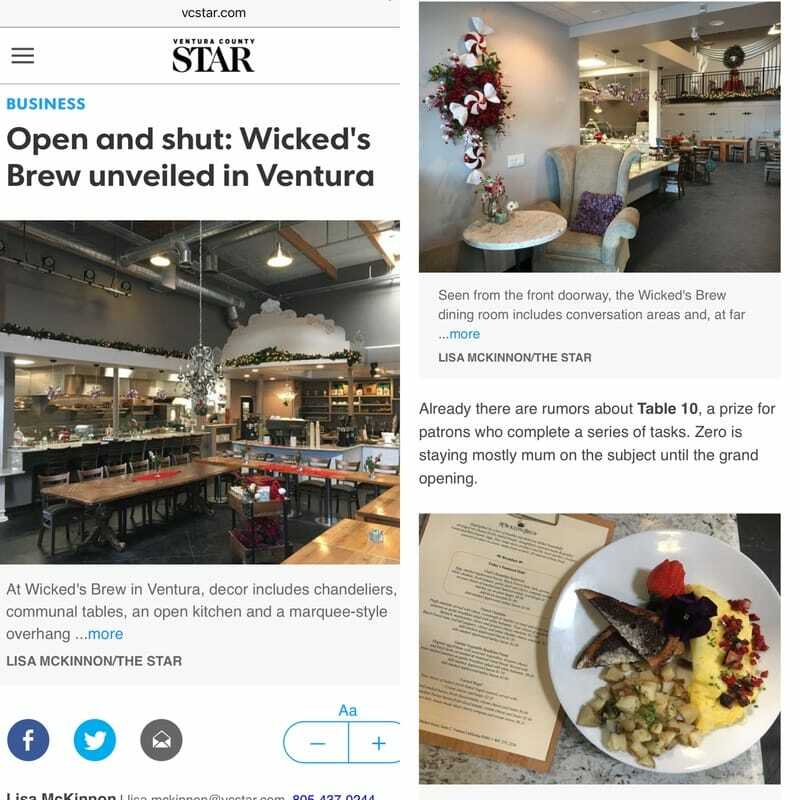 Take a menu of breakfast and lunch items, add cups of coffee, a pinch of retail and a foreshadowing of hands-on workshops to come, and you have Wicked's Brew, the combination cafe, coffeehouse, gift shop and events space that opened late last month in a Ventura business park. Also part of the mix: a healthy dose of theatricality, inspired by owner Gwendolyn Zero's behind-the-scenes work in the entertainment industry. "I'm gradually letting out certain details, but the more you see, the more there is to know," said Zero, whose work uniform includes a pair of black-and-white harlequin pants. Located at what used to be an aerial yoga studio next to Surf Brewery on Market Street, Wicked's Brew features an open dining room decorated with chandeliers, communal tables and an espresso bar under an overhang fashioned to look like a theater marquee. A table for two is displayed, just for show, atop a row of cabinets. The space eventually serves as a stage for what Zero calls the cafe's "cast of characters." Restaurant Review: Wicked's Brew Will Enliven Your Taste Buds. ​Wicked's Brew won't give you the shivers, but it might enliven your tastebuds. 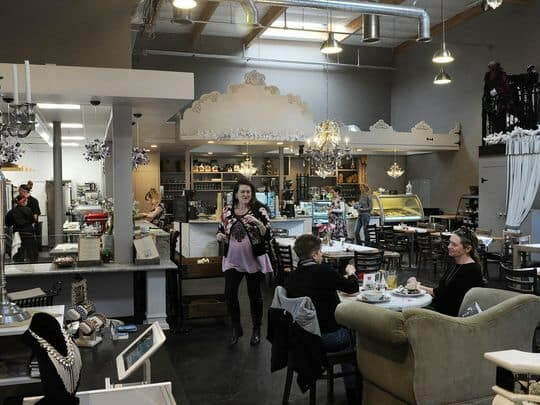 The new cafe, coffee house, gift shop and event space on Market Street in Ventura's industrial area is large and airy, with various areas dedicated to various things, but we focused on the breakfast food during a visit a few weeks ago. With copies of the menu in hand, we sat down to select our dishes, culling through the two pages that offered some intriguing items, though not as many as we had found online. We assumed that choices were made daily on which items to be prepared, allowing the cooks to focus on fewer items at a time, using available fresh ingredients. With decisions made, we went up to the order counter and voiced our choices. We ordered coffee first, both the Aero Press version ($4.50) and the brewed cup ($2), and both were very good. Unfortunately, while my Aero Press was steaming hot, my friend's was lukewarm. Signaling a server, she was quickly assured a replacement was on the way. It was, no doubt, but it took an unusually long time and we were already diving into our breakfast for quite a while before she got her coffee. Our choices were a Breakfast Sandwich ($9), Farmers Market Bowl ($8.50 with an egg added to the mix) and a French omelet ($11). The breakfast sandwich came on good marble rye bread, with an over-medium egg as requested, smoked Applewood bacon, Black Forest ham, baby greens, white Cheddar, fresh tomato and seasonings of garlic aioli and cherry compote, a hearty combination. ​Diners can choose other egg versions, scrambled or poached, as well as how they prefer their featured egg cooked. ​The French Omelet offered at Wicked's Brew. The basic Farmers Market Bowl featured roasted vegetables and sweet potatoes, quinoa, black beans and chipotle cream. It sounds like an exotic blend, but it was definitely very tasty. The added scrambled egg on the side added traditional balance. My choice of a spinach, mushroom, chive and smoked Gouda omelet was delicious, with the "petite" breakfast green salad adding a crisp touch. Oven-roasted potatoes are another option. From the bread choices, I opted for the "buttered" wheat bread but realized after a few bites that it wasn't buttered. Still it was good, freshly baked bread and didn't really need enhancement. There's also a French omelet version with Black Forest ham, red bell pepper and white Cheddar cheese, for $12.50. Other items on the day's menu included a garden vegetable breakfast panini, pancakes with seasonal fruit compote, caramelized apple-stuffed French toast and, for $5.75, Wicked's Gruel, with organic steel-cut, gluten-free oats served with the house-made fruit compote of the day, with the oats sweetened with brown sugar and maple syrup and moistened with steamed dairy or nondairy milk. Some of the Fabulous Desserts Offered at Wicked’s Brew. ​It's likely that on another day you might find other items available. On Saturdays, according to the online menu, Wicked's offers coconut mango lime pancakes. Breakfast muffins of varying sorts are available daily, as are scones and other familiar baked breakfast goodies. 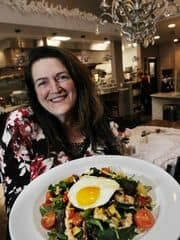 Owner Gwendolyn Zero is responsible for the creative atmosphere and good-natured staff, with culinary treats under the direction of chef Josiah Alaniz. and Angie Weber as they enjoy lunch in a beautiful setting. espresso bar, gift shop items, fabulous deserts and much more.